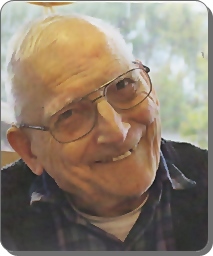 Theodore Henry Egeler, Sr., age 90, of Grand Rapids, formerly of Dorr, MI, was ushered into God's presence on Tuesday, May 8, 2018. He was a faithful servant, husband and father to his wife of 63 years, Shirley, who predeceased him in 2017. He was a wonderful father to Barbara Egeler-Bailey (Patrick) and Ted Egeler Jr. who survive him. He was a caring grandfather to his five grandsons, Paul Egeler, Andrew (Courtney) Egeler, Jon Egeler, Matthew Egeler and Ryan Egeler. Ted and Shirley taught their children and grandchildren to be faithful followers of Jesus Christ and how to be good stewards of the earth. Ted was the oldest son of the late William and Hattie (Kroupa) Egeler of Suttons Bay, MI. Ted is also survived by his brothers, Orville, Perry and Art Egeler. His older sister, Evelyn Potts, died in 1979. He was also predeceased by his brothers, Clifford and Ralph. Ted served faithfully in the Korean Conflict as a staff sergeant in Okinawa, helping to build the infrastructure and airfields. Ted was employed at General Motors in Wyoming, MI for 30 years. After his retirement, he drove school bus for Moline Christian School for a number of years and worked as a driver for West Michigan Auto Auction. He was a handyman who could fix or put together just about anything. His daughter, Barbara, especially relied on his help and skills. He had a quiet manner and a subtle sense of humor who made friends easily and had many long-lasting friendships. He will be missed by many. The family would like to thank the staff at Samaritas, Sunrise and Kindred Hospice for their loving care for our dad and grandpa. The family will greet visitors on Friday, May 11, from 2 - 4 and 6 - 8 pm at Stroo Funeral Home. The service will be held 11 am Saturday, May 12, at Boston Square Christian Reformed Church, 1803 Kalamazoo Ave. SE, with an hour of visitation prior to the service. Rev. Norm Thomasma will officiate. Interment in Dorr Cemetery.